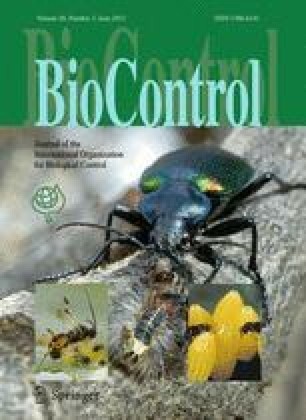 Development, survival and reproduction of the predatory mite Amblyseius swirskii (Athias-Henriot) (Acari: Phytoseiidae) were assessed when fed on cattail pollen (Typha latifolia L.), dried fruit mite (Carpoglyphus lactis L.), or on two artificial diets. The basic artificial diet (AD1) was composed of honey, sucrose, tryptone, yeast extract, and egg yolk. This diet was enriched (AD2) by adding hemolymph from oak silkworm pupae (Antheraea pernyi (Guérin-Méneville)). Mites fed on C. lactis and AD2 had shorter immature and preoviposition periods than those fed on the other diets. The total number of deposited eggs was significantly higher for females fed on AD2 than for those maintained on the other diets. The intrinsic rate of increase (rm) of A. swirskii was highest on AD2 and C. lactis, followed by T. latifolia pollen, and AD1. In conclusion, the artificial diet AD2 supported development and reproduction of A. swirskii to the same extent as a factitious prey which is routinely used in the mass rearing of the phytoseiid. Our findings indicate the potential of artificial diets for the mass production of this economically important predatory mite. We would like to thank Koppert B.V. and Biobest N.V. for support and for providing materials used in our experiments. The constructive comments from three anonymous reviewers and the handling editor are greatly appreciated. Nguyen Duc Tung is supported by a doctoral grant from the Vietnamese Ministry of Education and Training (MOET-VIED).